Subtle differences in shades of green in this animation reflect vegetation conditions worldwide. High values of Normalized Difference Vegetation Index, or NDVI, represent dense green functioning vegetation, and low NDVI values represent sparse green vegetation or vegetation under stress from limiting conditions, such as drought. 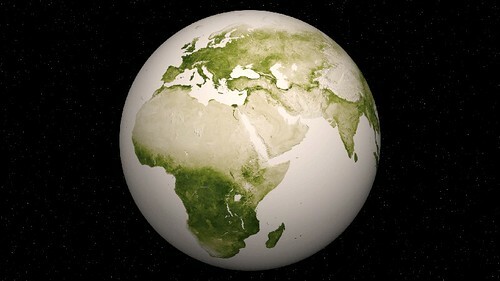 The still image is a snapshot of the Earth created from a year’s worth of data from April 2012 to April 2013. The information was sent back to Earth from the Visible-Infrared Imager/Radiometer Suite (VIIRS) instrument aboard the Suomi National Polar-orbiting Partnership or Suomi NPP satellite, a partnership between NASA and the National Oceanic and Atmospheric Administration, or NOAA.